You win your choice of one book off my July Bookshelf. Take a look and then email me your pick, and I'll get it to you. Now onto building my August bookshelf. Let me give you the blurb and then we'll chat on the other side! In Love Still Stands, a group of dedicated families leaves Bliss Creek to establish a new community in Missouri. Among them is Bethel Graber, a beautiful young woman with a passion for teaching. But after being disabled in a terrible accident, overseeing a classroom is out of the question…and romance seems a long-lost dream. I'm rather sure this is the first Amish fiction I've had on my blog. I'll admit, it's not typically a genre I gravitate towards, but I had a chance to read this book and I took it. Lucky for me I did. 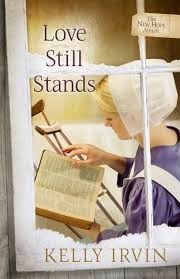 While Amish fiction was new to me, I truly enjoyed this book. Kelly Irvin packs these pages with so many different issues yet it never felt too weighty. It tackled things like postpartum depression, rehabilitation, and starting over in a new place all with a depth and breadth that kept me glued to the pages. While the story is not fast paced, it is intriguing in the sense that I honestly wanted to know how each character would overcome the obstacles in front of them. I did struggle some in the beginning getting to know each character, at times needing to refer to the chart in the front of the book. However, that soon passed and I became acquainted with the main players on the stage. This is a continuation of a series Kelly had already written, but I did not feel it necessary to have read those books first. I enjoyed the sweet romance as it budded between Bethel and Elijah, and I admit at times to wanting to swat each of them upside the head. They both had a tinge of stubbornness in them that bent in its own direction. I also enjoyed seeing Leah and Luke work at their marriage. Having been married nearly 17 years myself, it was refreshing to see a couple work through struggles but be committed to staying together. It played nicely against Bethel and Elijah's new romance. All together I found Kelly Irvin wove a wonderful story with rich characters in a setting I don't normally visit but was happy I had. You can purchase Love Still Stands here. Kelly has been married to photographer Tim Irvin for twenty-six years. They have two young adult children, two cats, and a tank full of fish. In her spare time, she likes to write short stories and read books by her favorite authors. 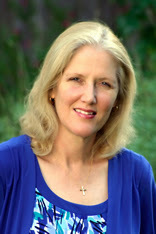 To find out more about Kelly and her books visit her at www.kellyirvin.com . Hi Kelly, it's good to meet you. So glad I stopped by to learn about your book!